Add old world charm and style to an indoor or outdoor wall in moments using the Panacea Street Lamp Wall Bracket. 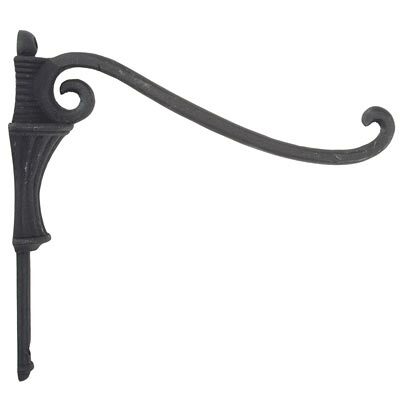 The unique detailing throughout this hardy bracket evokes a 19th century street lamp, with its rounded support with fluted detail and aged black color. The generous arm curves slightly downward and then upward, and its durable, cast aluminum construction withstands use season after season. The item easily holds hanging adornments up to 14" in diameter, and its aged black finish enhances your garden or home. A predrilled hole at both the top and base of the bracket make mounting simple, and included screws and anchors allow it to be placed on a wall or post in moments. Display hanging ornaments on a lovely bracket with this Street Lamp Wall Bracket. Lifetime warranty. Capacity: up to 17 lbs.